Handbook to Happiness: 99 cent ebook sale March 22-28! Handbook to Happiness uniquely explains the message of victorious Christian living through a practical, illustrated biblical counseling process. 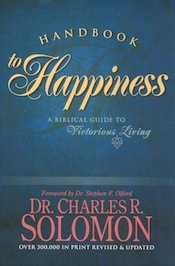 Since Dr. Charles Solomon authored Handbook over 40 years ago, over 300,000 copies have been printed in over 10 languages. For the first time, Tyndale Publishers is offering a huge discount on the ebook edition (regular price: $13.95). Now through Saturday you can get a copy for your laptop, Kindle or iPad for only 99 cents. The vendors honoring this promotion include Amazon and Apple’s iTunes Store. Why not get or gift an e-copy this week? Please spread the news! THE POINT IS: “No way; it can’t happen. That’s just not possible!” We may not like to hear it, but there are some things we simply cannot do. There are some obstacles we cannot overcome. There are some problems we cannot solve. We all have limitations. That’s just part of being human. Let’s face it, we can’t do everything. And even the things we do, don’t seem to do anything for us: not really, not fully, and not completely. That is because nothing we do will ever meet the deepest needs of our heart. Therefore, we need God’s salvation. Salvation is the greatest of all human impossibilities. Salvation is that supernatural work of God by which we are delivered from our old life in Adam into a new life in Christ. That’s real deliverance! Salvation results in our being changed from death to life, from darkness to light, and from sinners to saints. That’s true and lasting change of the best kind! Salvation makes us new creations in Christ. That’s the best that we can be! THE APPLICATION IS: So how does this work? Well, first of all you must face the fact that when it comes to living life as God intended, it’s humanly impossible! Simply put, with man—no way, but with God—yes way. And that’s where Christ comes in! 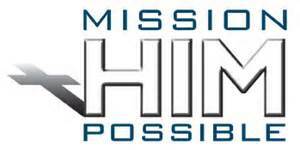 He comes into your life to complete you, fulfill you, and empower you to overcome your human impossibilities. Through Christ, God can make the impossible possible for you! He is the Almighty God and nothing is too hard for Him. He is the God of the impossible, and He makes all things possible. There are no limitations with God. He created all things and all things are subject to Him. Therefore, you should trust Him to rule and overrule in every area of every day of your life. He is the possible for your impossible. So, say it loud and say it often, “Yes I can…I can do all things through Christ!” As you live in union with Christ the possibilities are endless! Broken things need fixing – or so our every impulse tells us. Once upon a time, I bought a minivan for my growing family. It broke a lot. So I fixed a lot. It leaked oil, a lot of oil. Then its struts failed. Then the muffler fell off. Then the rear doors stopped opening. And the factory CD player got stolen. And the windshield cracked. And the driver’s seat ripped. And the lifters stuck so bad it sounded like machine gun fire. And the belts squeaked like screaming cats. See, Jesus is not the latest, greatest divine effort to fix the broken world. He is a new world. He is a new creation. He is a new van, a final replacement for that old, broken down lemon we’ve been driving around all these millennia. When I ditched my old van, I snatched the license plates off it, bolted them onto the replacement, and drove down the road in a new van. God, likewise, takes our identity off our old man, bolts it to the life of his son, and we drive down the road in a new man.